Curating other branded content has the power to bring more credibility to our own brands. It also helps us build relationships that can open up new doors, and it means fewer content creation tasks stacked high on our own plates. But, that doesn’t mean we’re off the hook completely. Quite the contrary, actually, because we have to select the best of the best. We’re like the librarians and fashion buyers of marketing — we have to find smart, beautiful content others will love. The pressure that comes with that responsibility is no different than the strategy that goes into our own content creation efforts. And like anything else we do, curating content takes time. Lucky for us, there are numerous tools and tricks to help. There are plenty of ways to put that newly discovered content into action. And the amplification benefits are widespread. Ready to build even more value for your audience and your brand? Here are content curation methods to help you do that. As a content marketer, your inbox probably looks like a fallout shelter, because you’re subscribed to numerous blogs. Invariably you’re too busy and don’t get around to reading all that content. Your inbox already has enough going on without taking on the role as content curation hub. Do it a favor and explore other avenues for your content hunt. The following platforms offer a guaranteed wealth of content to fuel your content curation strategy. Dig in daily or weekly, depending on your needs. 1. Twitter: Search topics and hashtags. Find recent content or other content you might have missed. 2. LinkedIn: Search topics and join groups. LinkedIn’s publishing platform is a force in the content influencer world. Use it. Also, the right group can become one of your hubs. Avoid overly promotional groups. 3. 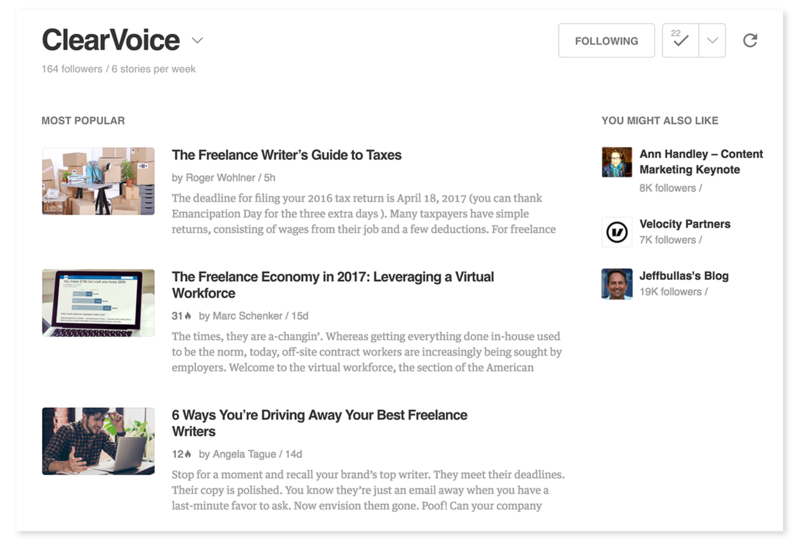 ClearVoice Content Studio: ClearVoice users can search Content Studio, our database of content and influencers, to find the top-performing posts on any topic. The index contains more than 150 million posts from over 277,000 of the most popular publishers across the web and is updated in realtime. 4. Quora: Search questions and ask questions. The best educational content brings solutions to problems, which is essentially what happens all the time on this site. Quora is a great content resource. 5. Your team: Repetitive instructional emails your team sends both internally and externally often hold hidden value. Many are blog posts in the making, and if you publish them, your team can potentially end the repetitive email curse by linking to a blog instead. Internal meetings and lunch-&-learns are other gold mines. Your team is truly one of the best resources around. 6. Conferences/events: Take what you learned or were inspired by, and spin that energizing experience into content. In addition to sessions and speakers, the people you meet are wonderful sources. 1. Editorial calendar: This is your content mecca, right? Might as well add the link to the schedule now, so you use it instead of losing it. 2. Twitter lists: In such a noisy space, Twitter lists come to the rescue. Organize your favorite resources in a way that makes sense to you. 3. Google Drive: A shared resource folder can be super valuable the next time you need quick data or visuals to support your content. Make sure your team has access, too. 4. Pocket: Get an email digest of recommended content or add your own and save them to your pocket for when you legitimately have time to read. Brilliant. 5. Feedly: Gather your go-to feeds in categories of your choosing. You can see the most popular articles in each category or feed. Options to read later as well. Once you’ve discovered the best content, there are numerous methods for using it. Here are just a few bright ways to put them to good use, beyond an ordinary listicle post. New research: Provide credibility to your piece with the latest report or guide. Aim to have one current stat (less than a year old) in every blog post. Stats: Speaking of stats…you can curate them into a highly sharable post. Think of all the work you did to track that perfect stat down. Others will thank you and potentially pin or bookmark your post as a go-to resource. Quotes: Similar to stats, we love quotes from experts. A great way to visually break up content and back up what you’re saying is with the help of an expert in your industry. Visuals: Infographics, ebooks, guides…curating these are useful for visual impact and/or when you don’t have a design team at your disposal. Favorite blogs/podcasts: Rather than just listing and linking, add your two cents about what makes them great and how the content can help your audience. Guest blog roundup: When you spot an intriguing question on Quora or provocative new research, frame a roundup blog around them and invite others to add value to the conversation. Amplification value: High. Curating content on your blog is the ultimate nod of approval. Be sure to mention other brands on social with a light nudge. If they don’t share, message and ask. The worst they can say is no, right? Newsletter/roundup: You can have a dedicated section of your company newsletter dedicated to great content beyond yours. Either feature one piece of content or include a roundup of top posts your team found. Sales conversations: When a prospect goes dark, an email nudge that brings educational value can go a long way. Customer check-ins: When a customer goes dark, an email sharing a thoughtful how-to post about a problem they are experiencing offers a solution and shows you care. Amplification value: Medium. Curating content through email is more about the value-add for your audience than relationship-building. 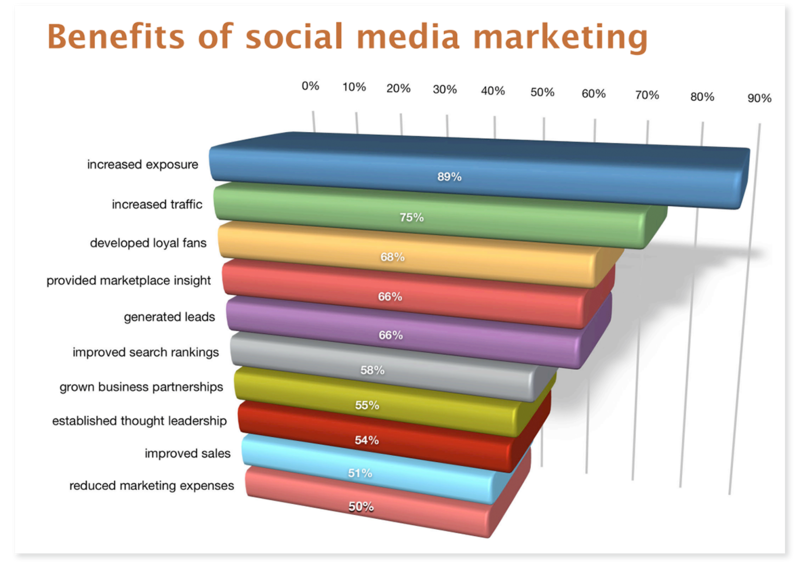 It will certainly help establish your brand as a resource. Infographics/ebooks: Data sourced from others is what makes an infographic or ebook you create even stronger. Source other organizations accordingly, and give them a heads-up that you wish to include them. They will likely reblog or share on social when the content is published. Webinars/videos: When slides or videos come into the content equation, again stats from trusted resources will back up your messaging. Just like above, you can potentially get them to share. Quizzes: You can spin the latest research into a fun quiz for your audience, or you can even take questions directly from a platform like Quora and flesh them out. Interactive content is a great way to bring any interesting concept to life, even if it’s not your own. Amplification value: High. This is akin to blogging, even though webinars and videos are more fluid than a readable post. Still, if you include an influencer quote or research from a report, you can potentially get amplification support. Even with all the other methods for content curation, social sharing is still a classic choice. You’re already sharing great content from other resources, because you’re using the 80/20 rule, right? The educational vibe of your feed is everything. Think about someone popping over to your Twitter feed and seeing just your posts. You want a healthy mix to show you’re passing along great wisdom. Share often, but also demonstrate your own prowess through meaningful conversations. And, the same theory goes with social selling. Share content that is relevant to your brand, but not created by it — and above all, be genuine. Amplification value: Super high. When others share your brand, because you’re curating their content, it’s the perfect “I’ll scratch your back, if you scratch mine” situation. Plus, the power of relationship-building can’t be stressed enough. Social niceness brings good things, possibly even lasting partnerships and new business. There is a ton of great content in the world…er, too much sometimes. You’re already swimming in it as a content expert, but there is so much more you can do beyond a like or share. The less talking we do about ourselves, the better we are at playing the content marketing game. By focusing on a sound content curation strategy, we can position ourselves as thought leaders in our space who consistently bring value to the table.